Jaundice is very common in the newborn baby but it could happen to adults as well. It is mainly a liver disorder and turned skin into yellowish. Jaundice happens due to an increase in the level of bilirubin in the blood which is also known as hyperbilirubinemia. Red blood cell breakdown is the main cause of increased bilirubin in the blood due to which skin turned yellow. Jaundice is not a disease itself but it is a sign of underlying disease process. Jaundice in adults can occur because of multiple medical conditions, which could be very serious. With the help of natural home remedies, jaundice treatment is possible at home. • Yellowish skin color is the major symptoms of jaundice. Causes of jaundice, why it happens? Jaundice occurs when bilirubin level in the blood exceeds 2.5-3 mg/dL. Bilirubin level in the blood may increase by the following reasons. 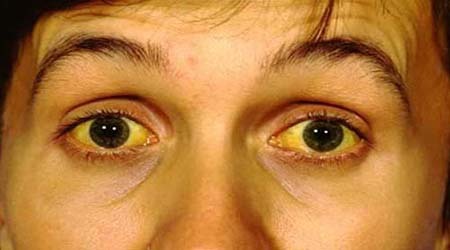 • Hepatitis: This is one of the main reason for jaundice in adults. • Alcohol: If you are drinking for a long period of time which could damage your liver and increases chances of getting jaundice. Natural remedies help you get fast relief from jaundice. If you are suffering from jaundice get the necessary medical test done and visit a doctor. By doing some change in your diet, lifestyle and taking home remedies can boost the speed of your recovery. Tomato contains lycopene which helps to cure the liver and get rid of jaundice naturally. It is also a good detoxifier which removes harmful toxins from your body. Tomato juice: Add 5-6 tomato in 500ml boiling water. Let tomato in it for 15 minutes then remove the skin and extract the juice by squeezing it. Drink this juice empty stomach in the morning for three weeks. Lemon is diuretic in nature which encourages urine production and helps to eliminate waste product including bilirubin from the body. It also keeps your body hydrated. Lemon juice- squeeze one teaspoon of juice from fresh lemon and mix with one glass water. Drink this mixture thrice in a day for 2 weeks. You can also add one pinch of salt to this. Lemon leaves- Put 10 lemon leaves in one cup of boiling water for 5 minutes. Strain this and drink twice in a day for two weeks. Don’t forget to cover the cup while boiling lemon leaves. Almond helps to purify blood and fight liver infection. It also contains nutrients like calcium, magnesium, iron, fiber which are very good for the liver. Ways to take almonds for jaundice treatment. Almond paste- Take 10 almonds, three dried dates, 4 cardamoms and soak them for a night. Peel the skin of almonds and remove seeds from dates, make it into a paste by grinding them. Add two teaspoons of sugar and one teaspoon of butter into this paste. Eat this homemade remedy once in a day for two weeks to get fast relief from jaundice in adults. Licorice is detoxifier in nature and which help the liver to detoxify harmful waste. It also cures liver and eliminates toxic metabolic substance. This is considered to be one of the best remedies to cure jaundice at home. Licorice Powder– Make the powder one teaspoon of each crushed licorice root, rock salt, and chicory seeds. Take half teaspoon of this powder twice in a day for two weeks to treat jaundice fast. Licorice with lemon juice– Take one and one-half cup of boiling water, add one teaspoon of crushed licorice and one teaspoon of ground ginger into it. Boil this for 15 minutes and strain this solution. After straining this solution add one teaspoon of lemon juice and drink this solution once in a day for a week. Carrots are very good for the liver. This remedy helps in clearing and repairing any damage to the liver. It contains beta-carotene which body converts into vitamin A and strengthen our immunity system. Ways to take carrot for fast jaundice cure. Carrot juice – Drink one glass of carrot juice twice in a day for several weeks. You can eat fresh carrot to faster your recovery from jaundice. Turmeric contains curcumin which helps the liver in the detoxification process. It also protects the liver from harmful toxins like alcohol. Way to take turmeric to fast jaundice treatment. Turmeric powder- Mix one-half teaspoon of turmeric powder with one glass of warm water and drink this solution twice in a day to for couple weeks. Another strong home remedy to cure jaundice at home. Barley helps to eliminate harmful toxins from the body along with bilirubin because of its diuretic property. Barley water- Boil one cup of barley in 3 liters of water for few hours. Strain this mixture and let it cool down. Drink this solution four times in a day for jaundice treatment. If you don’t like the taste you can add lemon, salt, and sugar. Barley powder- Take one teaspoon of roasted barley powder and mix with one cup of water. Add one teaspoon of honey and drink this mixture twice in a day. Radishes are another good remedy for liver and also help to cure jaundice. They work as a detoxifier which purifies blood and helps to flush out harmful toxins. Radishes leave juice – Drink one glass juice of fresh radishes leaves twice in a day for two weeks. For a better result, you can add one teaspoon of crushed basil leaves to it. Eat fresh radishes- You can also eat fresh radish directly in salad or soup. Try to eat black radish to faster recovery. This another natural remedy for jaundice treatment. Gooseberry is a good detoxifier which purifies blood and removes harmful toxins from the body. Gooseberry Juice- Drink two teaspoon of gooseberry juice with one glass of water twice in a day for jaundice treatment. Sugarcane is well known the natural remedy to which help to cure jaundice quickly. Glucose level during jaundice drop very fast and to maintain the level you should take sugarcane. Sugarcane is also helped you to keep your body hydrated because of its alkaline nature. • Juice: Drink one glass of sugarcane juice three times a day for two weeks. For better result, you can mix sugarcane juice with lemon juice. It will help you to cure jaundice fast and pass urine properly without any pain. • Basil leave paste- Another way to take sugarcane juice is with basil leaves paste. Take one glass of sugarcane juice and drink with one teaspoon of basil leaves paste twice in a day for two to three weeks. In Ayurveda jaundice is called Kamala. There are many ayurvedic natural herbs can be used as a treatment for jaundice. Berberis Vulgaris– It is very effective in all kind problems related to the liver. It is also one of the best herbs to cure jaundice and also known as “jaundice berry”. You can take a quarter of a teaspoon of berberis tonic three or four times in a day. Picrorrhiza- It is one of the best ayurvedic remedies for liver and jaundice. In Ayurveda, it is known as “kutki”. Take one teaspoon powder of picrorrhiza, mix with one glass of warm water. Drink this mixture twice in a day for a couple of weeks for jaundice treatment. Avipattikara choorna and arogya vardhini are very common ayurvedic medicine for jaundice treatment. Take one teaspoon of each twice a day with water for two weeks. Note: Before taking any kind of medicine you should consult with a doctor. Divya Sarvkalp Kwath- It is a good ayurvedic tonic for liver and jaundice treatment. It improves immunity and helps in quick recovery from jaundice.